Btw, Tess had a date yesterday with a young male dog called Paddy. 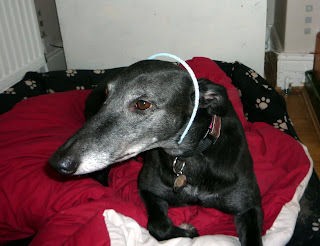 He's from the same charity Tess came from, the Retired Greyhound Trust and he's looking for a home. He came to visit us for a few hours to see if he and Tess could get along together, and who knows, he might eventually come and live with us. Tess spent most of the day growling at him, but he was a big softie and just ignored her. In the photo you can see his bandaged tail - he became distressed in the kennels and damaged it, so it's all bandaged up. We liked him so much he's coming back again next weekend for another visit. Watch this space.